This months guest recipe is by Alan Clarke Executive Chef for the Right Catering Company. Alan is a Native of Slane and his sister workers here with us. This beautiful presented dish, made using our smokey rapeseed oil, would make an excellent starter for an evening dinner party. For the cured salmon I would recommend working a day ahead to cure the salmon and have a nice firm consistency. Curing is very easy and can add a whole new element of consistency & flavour to the salmon. Simply cover the salmon fillet with the Oriel Salt and add some fresh dill to this. Leave overnight in the fridge and the next day wash the salt from the fillet and you should have a meaty firm texture to the salmon. The cucumber needs to be thinly sliced and added to the pickling solution simply made of Vinegar , water ,Sugar and Salt. Add some herbs to this for another flavour if you wish. This can be done a day ahead and placed in the fridge. Place the pickled beetroot onto the plate and garnish with blanched seasoned samphire. 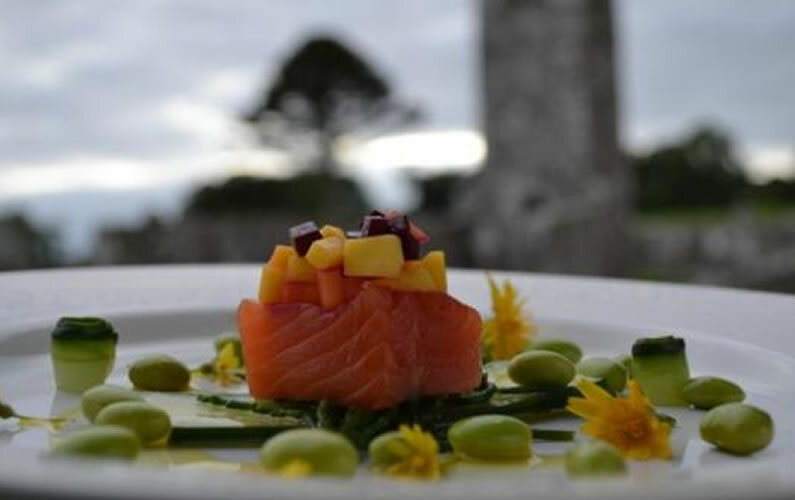 Add a cube of cured salmon onto this and place the finely diced mango and beetroot on top. A drizzle of lemony Greek yoghurt will add a creamy texture to the finished dish. Serve with a Sancerre and some homemade Guinness Treacle and Newgrange Camelina Oil bread .